Stay tuned for upcoming events for Pakistan Cup Final in near future. Pakistan Cup final will be played between the two top teams of group stage. Rawalpindi Stadium in Rawalpindi will host the final game of domestic One Day cricket tournament on 29 April 2017. 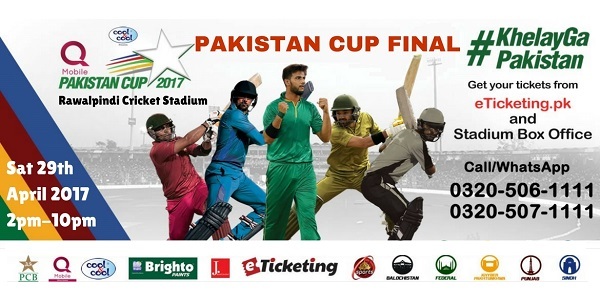 Pakistan Cup 2017 will start on 14 April, in which five provincial teams will participate. Team Khyber Pakhtunkhwa is the current champions of the tournament; they beat Punjab in the 2016 Pakistan Cup final by 151 runs to lift the trophy of tournament’s first edition. Pakistan Cup Final will be played between Balochistan and Islamabad on Sat 29th April 2017 at 3pm. Best Viewed at 1024 x 768 pixels and above. This Page loaded in 0.09396 seconds on Tue, Apr 23, 2019 (21:22).